The sun is just starting to rise on Jordan Dam as “Doc Ellen” Tinsley climbs out of her big pickup truck armed with a camping chair, a camera with an incredibly powerful lens, and a wealth of knowledge on the bald eagles that make their home at Jordan Lake in Chatham County. Tinsley is one of eight monitors at Jordan Lake, home to one of the largest breeding population of bald eagles in the state. There are at least 16 eagle nests around Jordan Lake the monitors track. Each monitor is sworn to secrecy about the location of the nests in order to help keep them safely protected. Tinsley has a connection with animals. In 1997, she fulfilled her dream and became a veterinarian, working for some 15 years with horses and their owners. Her career was sidelined by a serious vehicle accident in 2007, which left her unable to work in the field. 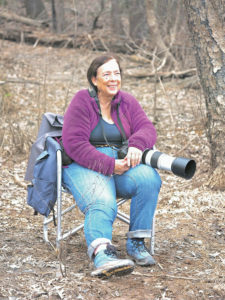 She discovered wildlife photography while rehabilitating from her injuries and learning to live with new limitations. She says that through photography, she was able to use her vet skills while doing field studies of bald eagles. Tinsley monitors three of the 16 nests at Jordan Lake. Soon after she began as a monitor, Tinsley discovered her first nest, which she aptly named “First Nest.” She named two birds Kate and Petruchio after characters in Shakespeare’s “Taming of the Shrew,” then realized that the two were building the nest — a site rarely witnessed by humans. The pair have been breeding and currently have eaglets in their nest. Upon arrival at the nest last week, Kate was in the nest tending to at least one eaglet. Tinsley’s second nest includes resident birds Hershey and Govida. The pair are still “courting,” according to Tinsley, a ritual which can last . Bald eagle courtship often includes high flying aerial maneuvers including the “death spiral” where the pair soars in the sky and interlocks talons in a dive while doing somersaults. This is a move that can sometimes be fatal for the animals because they may not release in time to survive. Because female bald eagles are larger than males, Tinsley notes that “you gotta be one heck of a male to take on a female.” Courtship acrobatics are a skill young eagles can be seen practicing before finding a mate. 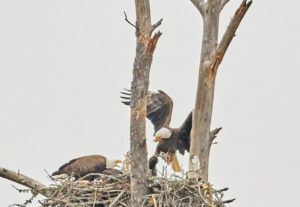 Tinsley’s final nest is Ranger Nest, named as it was found by a ranger who called her up saying, “Hey, Doc, we got a new nest.” Ranger Nest is unusual in terms of bald eagle nests. It rests in a swampy area and is devoid of the canopy that usually accompanies a nest. The tree is also precarious as it often swings in the wind when the parent birds are not there to weigh it down. Tinsley approaches this nest quietly to avoid disturbing the other waterfowl that inhabits the area near the nest. Tinsley monitors each of the nests to see if the pairs are still at the nest and if breeding is successful. Bald eagle breeding season is typically between December and June. Because the birds have a long reproduction cycle, typically 10 years from birth to successive offspring, the breeding period is especially important to monitor. According to Tinsley, half of all eaglets die in the first year. Of those, only about 40 percent survive the second year. So at Jordan Lake, if the 16 pairs produce two eggs, and if all those eggs hatch, by the first year typically only 16 will be left. The next year, only about nine or 10 will survive. “As a scientist, I would love to have them banded so we could see where our offspring is,” Tinsley said. Following the two hurricanes which struck North Carolina last fall, monitors have had difficulty accessing all the nests because of Jordan Lake’s high water levels. Many of the nests are best accessed by water and hiking near the nests will disturb the birds. With the lake being closed for such a long time, monitors have only been able to confirm six of the 16 nests as of last week. Bald eagles are federally protected in the United State. According to the U.S. Fish & Wildlife Service, the birds were in danger of extinction 40 years ago because of habitat destruction, illegal shooting, and contaminated food sources largely due to DDT, a pesticide that has since been banned. Federal law mandates that humans must stay at least 660 feet away from a bald eagle and its nest. Violations can bring fines from $5,000 to $50,000 and even jail time. During the past couple of weeks, Tinsley has twice witnessed intrusions by humans on eagle nests. The first occurred when was a man was observed walking under an eagle nest with a camera trying to capture a picture. The birds, disturbed that their personal space was violated, flew away from the nest. The eaglets at the nest were still within the first two weeks after hatching, a period before the birds are able to regulate their own temperature. Tinsley and park rangers were concerned the intrusion may lead to the birds abandoning their nest. Also, since temperatures had been low at the time and the young birds unable to maintain their temperature, there was concern that the amount of time the parents spent away from the nest may cause the eaglets’ death. The man was apparently unaware of the rules or the implications of his actions. After being provided an education by Tinsley, the man penitently provided the memory card of his camera to her and promised to not encroach on the nest again. A second intrusion was discovered by a ranger. 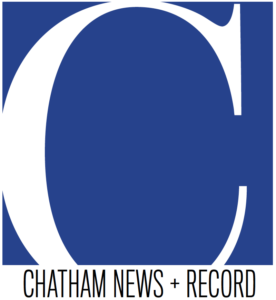 A man was found using a drone, flying devices that are banned at Jordan Lake. The man was flying his drone over an eagle nest in an attempt to photograph it and its residents. 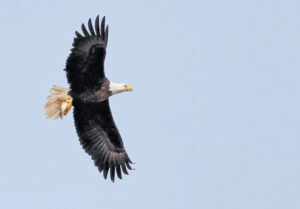 Drones are particularly disruptive to eagles, moreso than the helicopters that often fly over Jordan Lake, according to Tinsley. Drones are similar in size as other predators and are therefore particularly troublesome to eagle monitors. That’s why they are prohibited at the lake. Because of the drone’s flight, Tinsley said the parents flew away during the very sensitive first two weeks of the eaglets’ lives. Both intruders were caught and educated on the potential damage they may have caused. But that’s not always the case. Fortunately, monitors found that the parents at both nests returned to their eaglets. The damage to the eaglets and their viability of these actions is still not known. Bald eagle habitats are inextricably linked to large bodies of fresh water. The large birds require a steady diet of fish to sustain themselves and are often found near large lakes and the mouths of large rivers. In the 1980s, when the Army Corps of Engineers created Jordan Lake to control flooding downstream in the Cape Fear River, efforts were made to introduce bald eagles at the lake. According to Tinsley, the first attempts were not successful, with most or all of the eaglets dying. It took nearly a decade for there to be evidence of a burgeoning bald eagle population in the area. Young eagles will build their nests close to where they fledged from their parents’ nest, usually between one and five miles from where they hatched. Though the nests are off-limits to would-be observers, there are actually ample opportunities to watch bald eagles at Jordan Lake. In fact, it’s likely that visitors have seen many of them but had no idea what they were seeing. Bald eagles go through color variations as they mature, only gaining their brilliant white heads at five years of age. Winter time is the best time to view eagles. They are particularly active as its the breeding season, but at the same time, the lack of foliage on the trees provides little camouflage for them. 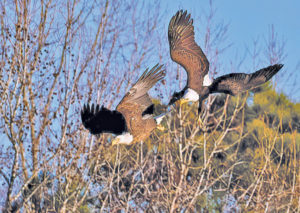 Though they exist at Jordan Lake year-round, once trees bud the bald eagles can be impossible to see on the branches. Visitors can go to the Jordan Dam in Moncure and sit in the recreation area early in the morning or later in the evening. Tinsley suggests bringing a chair and sitting quietly looking downstream on the Haw River. Patience is the best way to view a bald eagle because they’ll often fly up toward the recreation area while feeding if they do not feel encroached upon. As Tinsley sat there last week, she and her group observed no fewer than a dozen bald eagles feeding on the river. The Jordan Lake Visitors Center is hosting “Doc Ellen” Tinsley this weekend to discuss bald eagles and provide an opportunity to observe bald eagles. The Feb. 16 event runs from 10 a.m. to noon at the Visitors Center located on State Park Drive just off of U.S. 64. All are welcome and no registration is required. For more information email steve.mcmurray@ncparks.gov. There is also an extensive exhibit on Jordan Lake’s bald eagle population located in the Jordan Lake Visitors Center. In addition to Tinsley’s eagle photographs, the exhibit also hosts a mock eagle nest which allows visitors to fully understand the size of the birds.